Clash of Clans is a strategy based mobile video game. With more than 500 million downloads on google play store only, it is easily one of the all time most famous mobile game ever developed. Game is centered around a small village which is given to the players at the start. As you collect resources, build defenses and level up the “town hall”, gameplay widens. New troops or buildings are unlocked at each town hall level. May be the reason Clash of Clans has excelled so far in extremely competitive gaming industry is because of constant updates and changes that game receives. SUPERCELL is doing a fine job in maintaining this game a fan favorite. With continues updates and changes, new attack/defense strategies emerge and it is very important for Clash of Clan players to change their approach every once in a while. In this article, we will tell you about some Town Hall 9 troops strategies that will not only aid you in war attacks but also in multiplayer loot attacks. 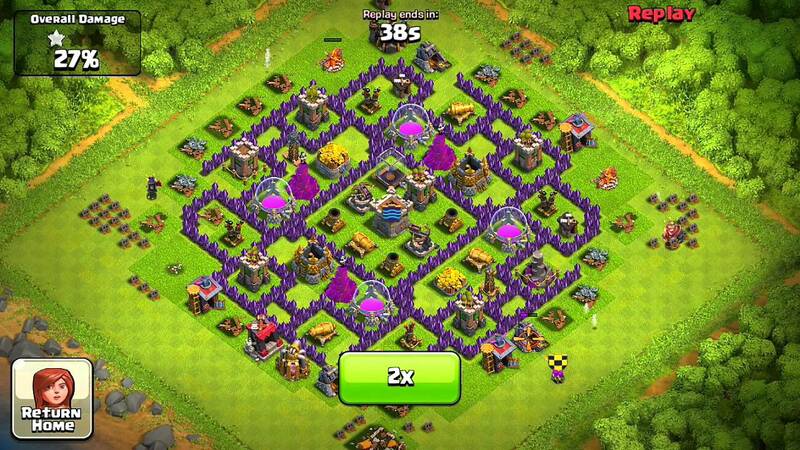 Farming: Farming or looting is a common process in Clash of Clans. Players use farming technique to fill up resource’s storage in a very short amount of time. During this attack, trophies are not important. You can easily find high resource base with low level defense in lower league. That is why most of the time, even high-level players, drop their trophy count to attack on low level opponents. For farming attack, you should upgrade your Loons asap; save dark elixir and level up your Queen. Simple Queen and Loons attack is very successful for farming in lower leagues. Goblins with Giants is another good way to collect some loot. It is elixir efficient too. War Attack: For Th9 war attacks, GOWIWIBO (Golem, Witch, Wizard, Bowler) is one of the best strategies to get 3 stars. Try using 2 Golems, 4 Wall Breakers, 8 Wizards, 10 Witches and Bowlers in your clan castle. On the downside, this army will cost you a huge amount of Dark Elixir which will be much higher than the reward you will get for victory in the war. So, if you are looking for confirm 3 stars and you don’t worry about the cost, use this strategy. Although if you consider this army to be extra costly, try using LAVALOONS and Minions. Take 4 Lava Hounds (1 in the Clan Castle), 16 Loons and nearly 25 Minions. Spells can be rage, haste or both. You must take some poison spell with you in the attack otherwise troops in the enemy clan castle will destroy your LAVA and you will not get the desired result. Next time when you attack, try these strategies and you will feel the difference. Be sure to check our website for TH10, TH11 and TH12 attack strategies.